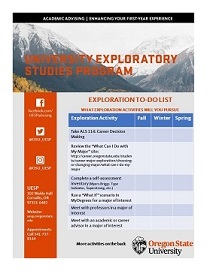 University Exploratory Studies Program (UESP) is the academic home for students who have chosen to explore their options prior to deciding on a major. UESP is very similar to OSU's academic colleges in that we provide academic support to assure that our students are making satisfactory progress toward a degree. We offer a comprehensive range of services to help students make informed decisions about their academic coursework and potential majors they're considering. You can now schedule your appointments with your UESP advisor using the Handshake platform. Handshake is used by the Career Development Center as an interface to career opportunities and resources, and it also has an appointment scheduling tool. They have graciously allowed us to jump on board and allow our student to use this tool to schedule appointments with us. Here are instructions on how to use Handshake for UESP appointment scheduling. Applications for the 2019 Job Shadow Program are available to UESP students only, and are due by 11:59pm on April 26, 2019. After you’ve read more about the program and host sites, click here to access the application form. If you have questions about this opportunity or would like assistance with the application process, contact either career@oregonstate.edu or uesp.advisor@oregonstate.edu. Current UESP Students: Week 5 is here, and May is upon us. Those two things mean priority registration for fall is just around the corner, and we need to get going with advising. If you haven’t done so already, stop by 102 Waldo or call 541-737-8144 to schedule your mandatory 30-minute advising appointment. You can also schedule online with your advisor using Handshake (see instructions here). We get booked out very quickly in the fall, so call or stop by within the next week to ensure that you get an appointment before your priority registration date. If you are in your first year, you should review the First Year Advising Syllabus. Regardless of whether you are in your first year or you’ve been here a bit, the focus of this appointment will be on your Exploration. 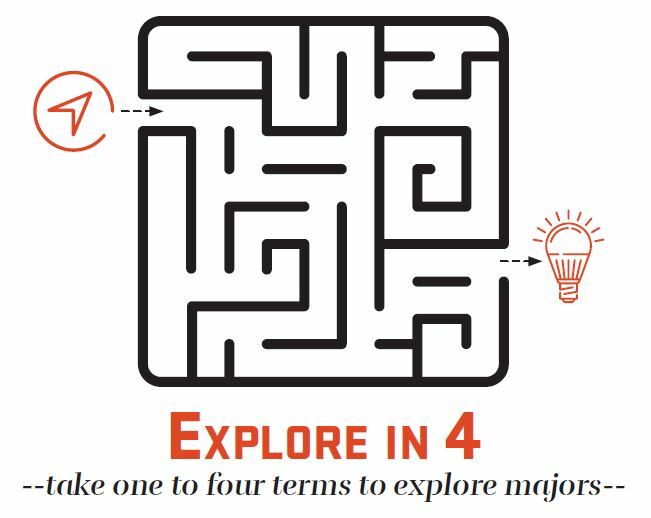 Where are you with your major exploration? Think about the experiences you’ve had inside and outside of the classroom and how they might be influencing your thoughts on a major. Click the image to the left and download the Exploration To-Do List. Start working on it and outlining what you have done and what you want to do in coming terms. Bring it to your appointment and you’ll be entered into a raffle drawing for a $50 gift card. Do some pre-planning.Look at the online schedule of classes and develop a list of classes you might want to take fall term. Look in MyDegrees to see what Bacc Core categories you still need to fill, or run a What If scenario to see if a major you are exploring would have classes you might want to take. Remember that you have access to your MyDegrees Planner and you have access to Scheduler. Feel free to use these resources to store your ideas. Please note with MyDegrees– some of you may have locked plans. If that is the case, just create a new plan and call it “My UESP Plan”. If you prefer paper, that’s cool. Bring your notes with you. If you know what you want to declare, we encourage you to move forward on that now if you can. That way you can meet with your new major advisor to plan for fall term. Declared, but thinking about a change in direction? It is a very common experience for students to realize that their initial major choice is not the right fit. If that is your experience, don't panic! UESP is here to help you figure out which major direction at OSU is right for you. You're welcome to switch to UESP or even just consult with one of our advisors. Either way just requires that you make an appointment. Call our office at 541-737-8144 or stop by 102 Waldo Hall to schedule with a UESP Advisor. For students starting with or transferring into UESP in summer 2017 beyond, we now have a 4-term limit. Click the image to learn more. Keep up on your exploration! We’d love it if you follow us on Twitter or like us on Facebook or follow us on Instagram – we try to use social media in addition to these weekly emails to aid you in your exploration. Looking to add structure to your approach to your academics? Consider using Zero to Success in 77 Days, a week-by-week academic to do list established by OSU advisors. Were you able to find what you came to this website looking for?